$10.95 for 1 stamp. Bulk discounts are available, depending on the total price of the order (see below). For instance, if you bought 10 stamps, you would receive a 10% discount. To do so, right-click on the image and click "Save Image". Make a note of where you save the image. 3) Go to the box: "Optional: Upload logo or image". Click on "Browse," which is beneath that box. Upload the PNG file that you saved in step 1. The design is already set, so you don't need to adjust any settings. 4) Checkout and pay. If you spend $100 or more, you can get a 10% or more discount depending on how much you order. You can find a link on the second step of the checkout process, underneath the list of shipping options, where it says Promotional Code; this is where you can enter a discount code. For instance, the code DSCNT10 will deduct 10% off of the price of your order. * NOTE: This order does not include an ink pad. You can buy your own ink pad or purchase an ink pad from the same company, which can be found at: http://www.rubberstamps.net/ProductDetail.aspx?productid=STAMP%20PAD. Below is the poster for the PLM Stamp. Click on it to see the full-size version. Prisons regularly stamp outgoing mail from incarcerated people with a stigmatizing stamp that states: “This correspondence is from an inmate at a correctional institution.” This is done despite the fact that the mail already has been searched for contraband and read by security staff; and prisons already require incarcerated people to put their full names, ID #s, and return addresses on the envelopes. 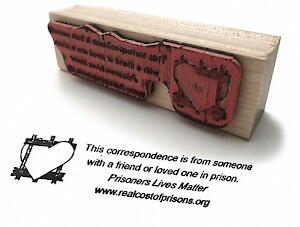 The stigmatizing stamp used by the prison reinforces a common misconception that all people in prison are dangerous. It reinforces the shame and stigma that have led many people to hide the fact that their brother, cousin, daughter, son, father, or loved one is in prison. Such stigmatization also facilitates the ostracizing and abuse of the two million incarcerated Americans, whose rights and dignity are violated regularly by our prison policies and who, upon release, are relegated to the status of second-class citizens. In fact, after five decades of “tough-on-crime” aggressive prosecution practices and the expansion of the Prison Industrial Complex, prisons hold many people (including those who have been convicted of serious crimes) who are not dangerous. Many have educated themselves in prison and have worked hard to improve their lives. And many are elderly and have “aged out” of crime. 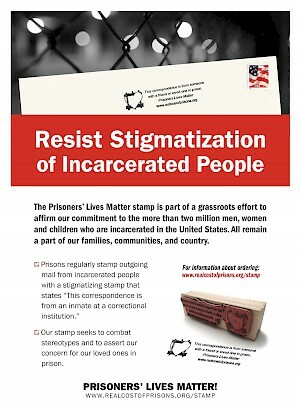 Our Prisoners’ Lives Matter stamp seeks to resist the cycle of shame, stereotypes, and abuse associated with incarceration. Our stamp has a positive message. It reminds us that that the two million men, women, and children who are incarcerated in this country remain an integral part of our human family and their well-being matters to us. It also directs people to the Real Costs of Prisons website where they can learn more about the financial and human costs of mass incarceration as well as find amazing artwork and writings by people who are incarcerated. We hope our stamp will encourage more of us to affirm that our own humanity is bound up with the lives of our fellow human beings who are incarcerated. And we hope that, as more people see the stamp, they will be emboldened to speak out publicly to both friends and legislators to advocate for a more humane and just legal system. To be most effective, use the stamp on all of your outgoing mail.